The optimisation of artificial intelligence in the coming era will bring unprecedented changes to all aspects of society. We at DataToBiz want to stay on top of this cutting edge technology, and we want to help your company do the same. Our talented team of IT experts and consultants has been trusted by thousands of companies and individuals. If you’re still not convinced, take it from Clutch, a B2B ratings and reviews platform in Washington, D.C. We joined their platform to see how we rank against the competition and already we’re reaping the benefits: we’ve achieved a position on their list of the top artificial intelligence companies in 2019! Our work has provided a pivotal source of revenue for this former client, and it could do the same for your company. Reach out to us today with your data science and AI needs and we will offer the same devotion and passion to a customised, data-driven solution for you. And if you’d like even further confirmation of our superior service, check out Clutch’s sister websites, The Manifest and Visual Objects. The Manifest is a resource that offers industry insights, how-to-guides, and recommendations of top service providers like us; we scored a spot on their list of AI developers in India. Visual Objects is a new platform that equips buyers with a digital portfolio of B2B companies’ previous projects to aid buying decisions; our portfolio is on their list of top custom software developers. 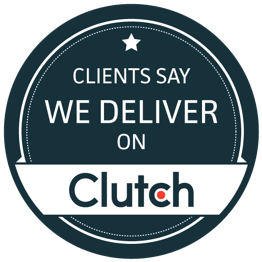 We’d like to thank our friends at Clutch for including us in their 2019 research, and we thank all those who have helped our company along the way. These achievements encourage us to work even harder for our current and new clients in the upcoming years.